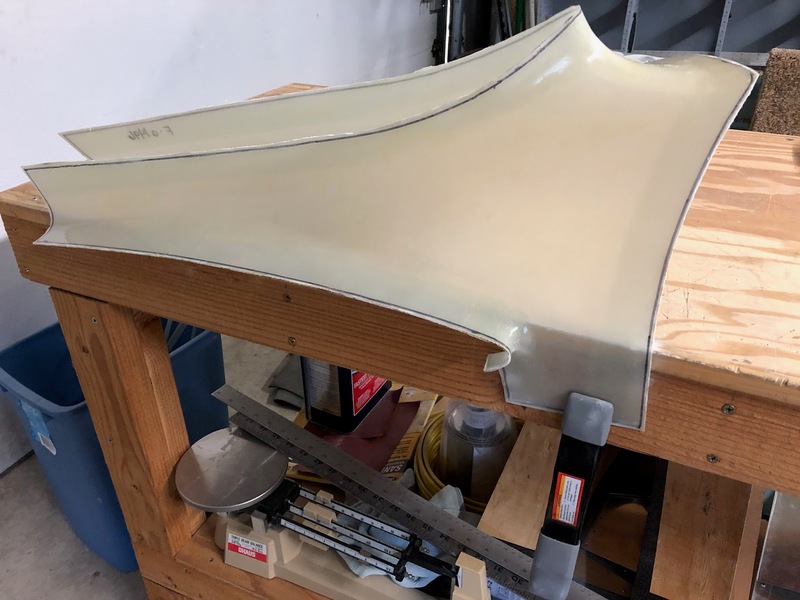 Back to fiberglass work. 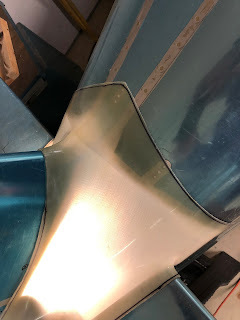 Today I tackled fitting the empennage fairing. The fairing is provided oversize with a final trim line scribed in the top coat. The trim line is hard to see so I traced over it with black marker. Since I use one hand for the shop vac hose and the other hand for the dremel, I clamped the fairing to the work table to keep it from moving. 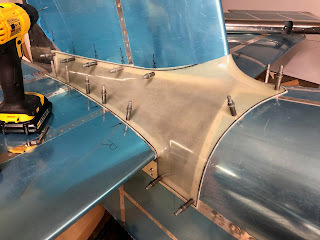 After doing the initial trim leaving 1/8 inch extra margin you fit the fairing to the empennage. The trick in fitting is to get the saddles on the leading edge of the horizontal stab to have less than 1/16 inch of gap. You do this by trimming back the vertical stab saddle and by thinning some of the thicker spots of the fairing. I had to trim about 1/8 inch inside of the scribe line in the vertical stab saddle area to get a good fit. 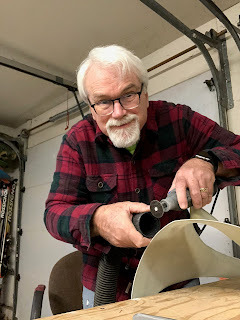 The fairing is flexible so a good fit is helped by using some body english as well as trimming. Next you place a light inside of the empennage area to illuminate where the screw holes are and drill #40 holes in the fiberglass to match. It's important to tightly hold the fairing in place to maintain the close fit to the h-stab saddle areas. The manual suggests taping it in place, but I couldn't get the tape to hold securely enough and I wasn't confident it wouldn't shift. The fit looks really good at this point. Everything is lying down and the saddle gaps are very small. The mold for the fairing is very accurate. I've seen some other RV's that had to use lots of flox and bondo to get a fit this close. 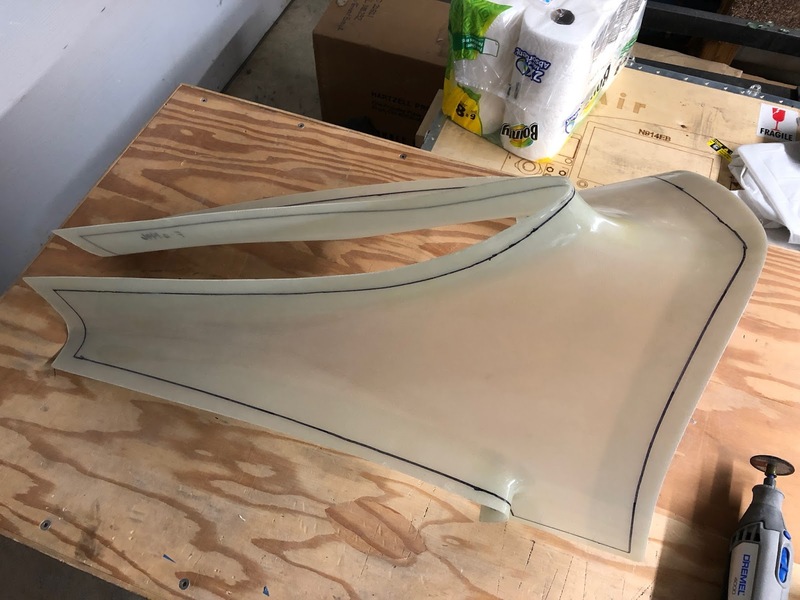 I'm very impressed with the quality of the RV-14 fiberglass parts so far.